We’re thrilled to announce the Form 1+ today, an extensive overhaul of our flagship desktop stereolithography 3D printer. 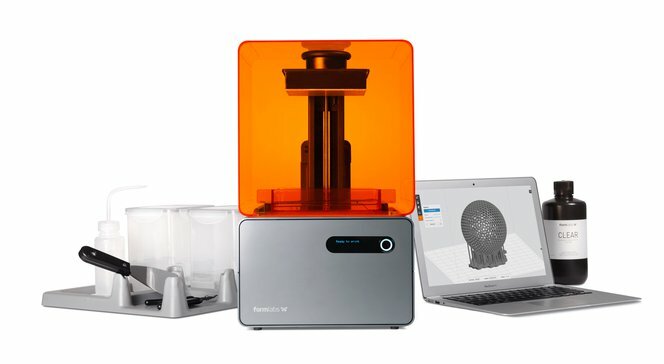 Since our launch on Kickstarter in 2012, we’ve shipped the Form 1 to thousands of customers around the world and they’ve been printing amazing, useful, and beautiful models. From biotech to architecture, research labs to engineering prototypes, their creations have inspired us to keep improving. We’ve been learning from them every step of the way. The Form 1+ features dozens of upgraded components for a printing experience that is more reliable and up to 50% faster that produces the same high-resolution prints. We’re so confident in the updates we’ve made that all Form 1+ orders ship with a one-year warranty, all for the same $3,299 (€2,799). A light-blocking injection-molded resin tank for better print consistency &ndash; allowing you to store your tanks outside the Form 1. The tank also comes with a stackable lid, helping you manage multiple resins more easily. We’re also excited to be releasing our all-new Black resin, today, as well as PreForm 1.5, which introduces our most-requested feature &ndash; manual support controls. Give it a try and let us know how it works with your new models. We’ll be posting additional details on our new software, resin, as well as our upgraded support site & online European store, throughout the day.